way to show your support and spread awareness for autism. 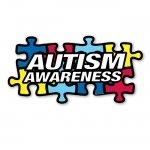 Can also be a great fundraiser item for autism awareness organizations, schools, or awareness groups. Available in either sticker, for outside of the vehicle - or - re-positionable cling for inside a window.